About Lawrence: Early in the third century AD, Lawrence, most likely from Spain, made his way to Rome. There he was appointed chief of the seven deacons and was given the responsibility to manage Church property and finances. 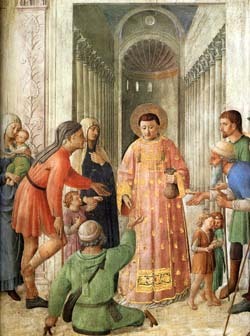 The emperor at the time, who thought that the Church had valuable things worth confiscating, ordered Lawrence to produce the ‘treasures of the Church.’ According to tradition, Lawrence brought before the emperor the poor whose lives had been touched by Christian charity. He was then jailed and eventually executed in the year AD 258 by being roasted on a gridiron. His martyrdom left a deep impression on the young Church because he was a Roman citizen tortured and executed by Roman authorities. Almost immediately, the date of this death, August 10, became a permanent fixture on the early commemorative calendar of the Church. (adapted from The Treasury of Daily Prayer, CPH). Reflection: I would think Lawrence knew the location of the Church’s treasure! He knew exactly where it was as in the old pirate maps: when X marks the spot, that is the Cross of Jesus Christ. He knew that the treasures of Christ’s grace is for the poor, the lame, the orphans and the widows, for all who hunger and thirst for righteousness, that is, the poor in spirit. In the midst of Watergate in the 70s, Bob Woodward was told by his informant, “to follow the money”. All of the world follows the money. Lawrence did not “follow the money”: he followed His Lord and yours. As a steward of Jesus Christ, His deacon, Lawrence maintained earthly treasure probably well but gold does not make the Church, only the blood of Christ. When the Church and her Christians think the true treasures of the church are in the offering plates/big budgets or our “creative ministries” or our programs, and not the Cross and Sacraments, Scripture and Service in His love, then, “…we are in danger of losing the things that make the Church in favor of those who claim to make the Church. Church leaders only gain legitimacy when they are the delivery point of the divine gifts.” (Pr. Murray, A Year with the Church Fathers, CPH) Lawrence and many others so delivered the divine gifts and were delivered up as martyrs and their witness heartens us. The Commemoration of St. Lawrence is our time quite timely, to say the least, given the martyrdoms that have occurred and are happening in Egypt, Syria, Iraq and Nigeria. It is hard to contemplate Lawrence being killed by being roasted live on fire. It is hard to believe a 5 year old boy being cut in half by ISIS. We hear that ISIS is full of anger and hatred…but are they? Were the Nazis full of hatred and anger when they murdered 6 million Jews and 5 milion Gypsies, Communists, homosexuals and Christians? Probably at one time. In a seminary seminar course on the Holocaust we studied the fact that initially the Nazis took Jews in train cars to isolated areas and then gunned them down burying them in mass graves. The Nazi State soon realized this was using too much ammunition, time and effort, too many vital war assets. Eventually they improved the ‘extermination’ of Jews and others with the invention of Zykon-B gas and high tech ovens to burn the bodies efficiently into ashes. There was no more anger and hatred, just cold-blooded technological efficiency. Gracious Lord, in every age You have sent men and women who have given their lives for the message of Your Gospel and all the unsearchable riches of Jesus Christ. Inspire us with the memory of those martyrs for the Gospel, like Your servant Lawrence, whose faithfulness led them to the way of the cross, and give us courage to bear full witness with our lives to Your Son’s victory over sin and death, through Jesus Christ our Lord. Amen.